Nick Wheeler, one of my all times Flickr favorites, just uploaded a new picture to DIYP pool. (And yes, it is the same Nick who brought you The DIY Strip Light and the Floor Lit Table Top Studio). The posing on this picture is great, but the first eye catcher of this image is the Dave Hill post processing look it has. If you don’t know Dave Hill, please, sit back and treat yourself to an hour of fine photography. Dave is known for two things: You can not forget his portraits ones you’ve seen them – the visual impact is very strong. And you can not ignore his unique post processing look, what has become to be known as “The Dave Hill Look”. It looks like the web is all over Dave this month, as both the Stobist mail-tiviewed him and Scott Kelby gave a great tip on how to create a Dave Hill look in Lightroom. 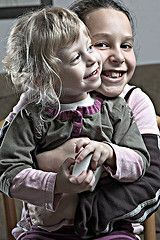 This is what I started with – an image of my love one and her double-second-cousin. The next step is to select “vivid light” as the layer blending mode. Now flatten the layers (CTRL + SHIFT + E). Again, duplicate the layer, and do a High Pass filter on the dup. 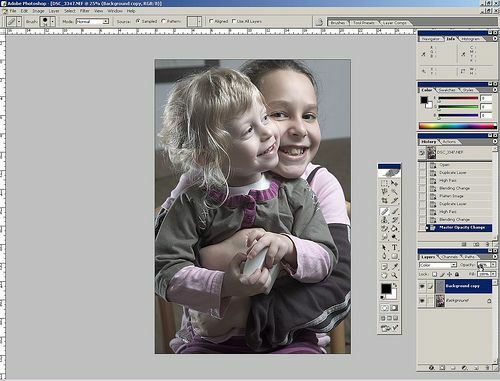 This time select 6.9 as radius and color as blending mode. 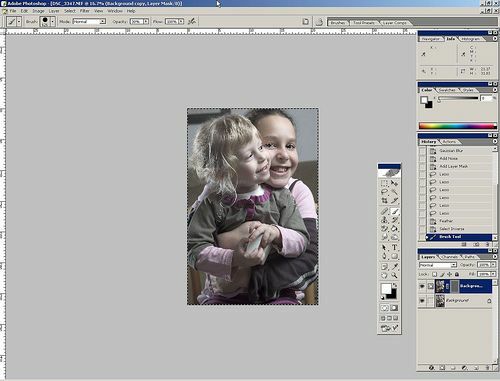 Now choose layer opacity 40% and flattened again. 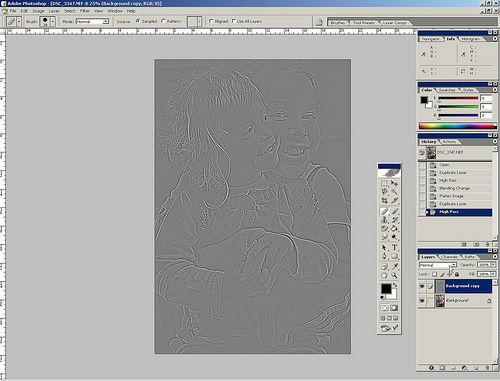 Now again – duplicate the layer. Now call on the Gaussian Blur (Filter-> Blur-> Gaussian Blur) filter and set it to 9.5. Still using the dup layer, call on the noise filter (Filter -> Noise -> Add Noise) and apply 3% noise. OK, that looks really blurry, we will do something about it. Like remove all the blur from the eyes and …. Now add a layer mask (Layer -> Add Layer Mask -> Hide All), and select the eyes using the lasso tool (L is the short cut for this). Now invert the selection (Shift + Control + I). 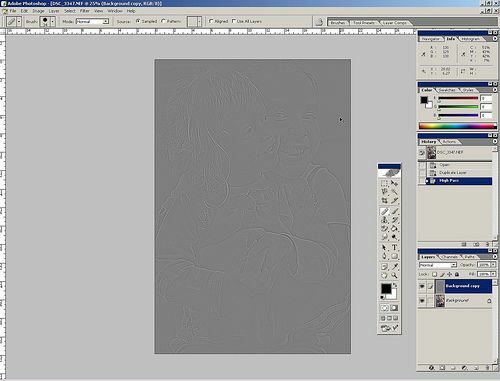 Now take the brush tool (B) set the opacity to 30% and paint over the entire image. TADA! Eyes are a bit sharper then the rest of the image. Flatten again. The final step is to apply some unsharp mask filter (Filter -> Sharpen -> Unsharp Mask). Use the following values: Amount 100%, Radius 30.0 Pixels, Threshold 0. And ….